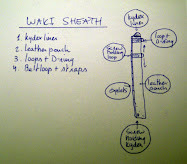 Instead of using Kydex for a liner, this liner is made of pure 2mm thick Lappleather. 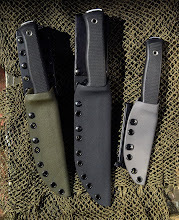 Nature’s Kydex !! 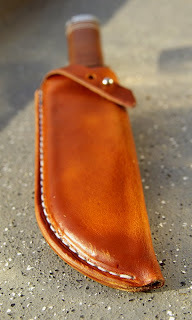 The outerpouch is made of premium halftanned leather with a thickness of 2mm. 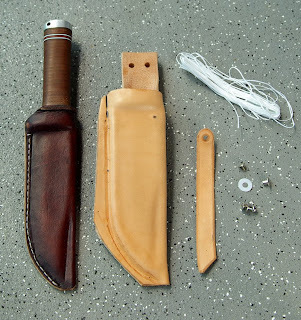 It’s a very pretty blade, and it won’t see any extreme use, so I made this sheath from thinner leather then the Ratweiler sheath, but all in good proportions. It’s tough as nails. 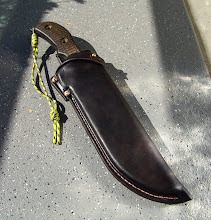 I think that a traditional leatherhandled knife like this belongs in a leather sheath rather then one made with Kydex.The outside of the blade is made of relatively soft steel which will scratch easily, so I guess this is a better option then making a kydex liner. 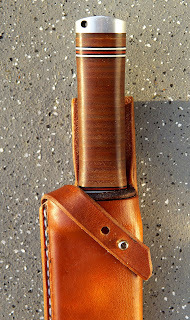 Even the rawhide might scratch the blade a bit, so this is definitely not a sheath for a safequeen. 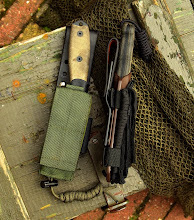 It’s a sheath that is very robust and, for leather, very weatherproof, yet comfortable and safe to use in an outdoor environment doing stuff like hunting and fishing, hiking and camping etc. It’s o.k when it gets wet every once in a while. 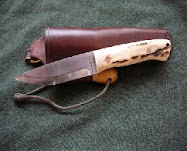 Because it’s folded, and due to the nature of the materials used the sheath is rigid, but due to the treatment with beeswax it’s not brittle. Everything has a slight flex. 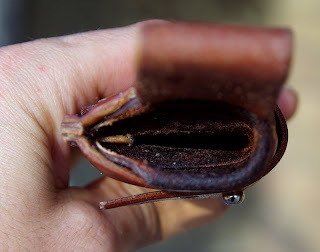 This type of leather is very hard to puncture or cut through. 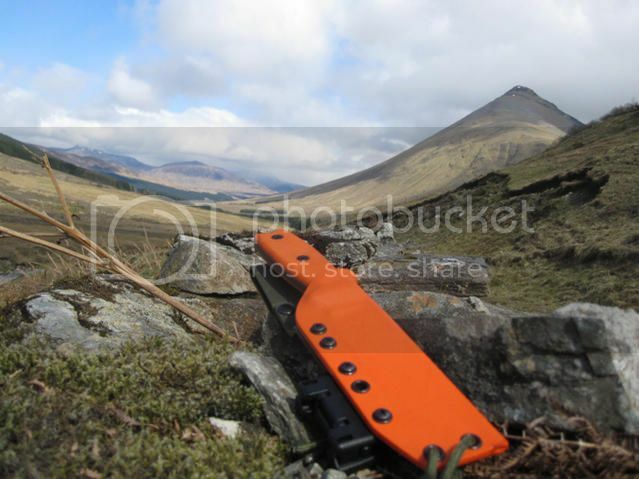 This design gives maximum acces to the blade, which sits secure, even without a retaining strap. 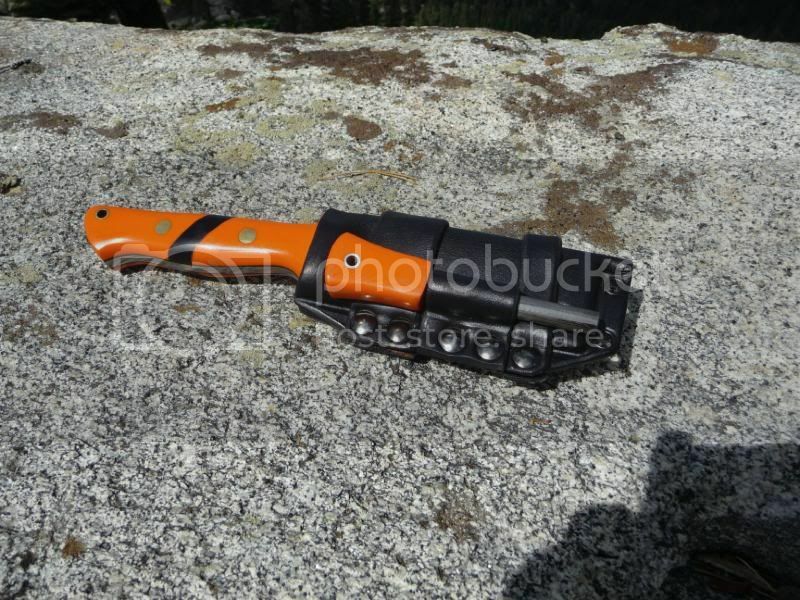 It shows more handle then conventional pouch style of sheaths do, so it’s easy to grab. 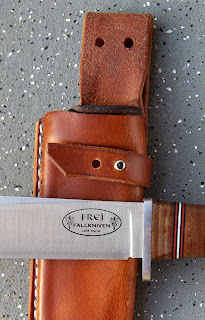 The leather that is used is so dense that will take a long time to fully saturate it with water, therefore this is o.k..The welt is made of a strip of the same piece of rawhide and is the same extremely tough stuff to cut through. 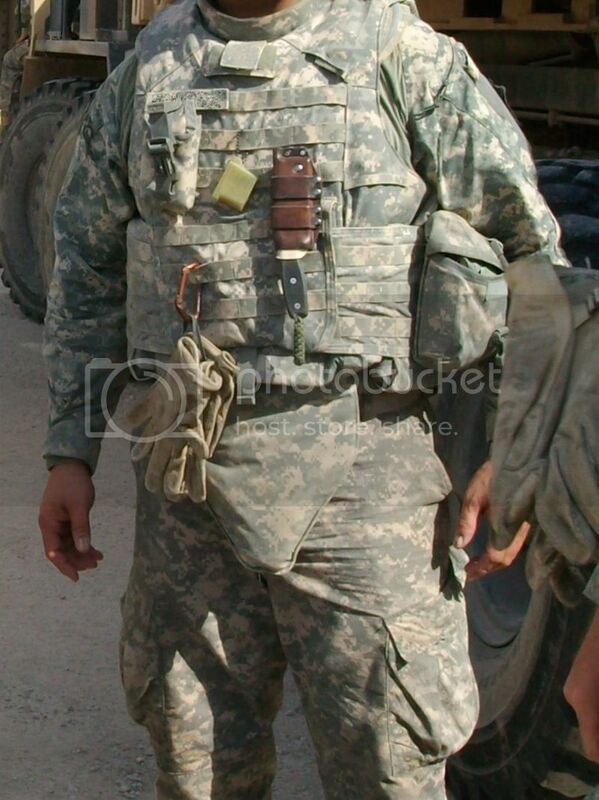 The stitching will be protected for many and many years to come. Behind the welt of the liner there's leather from the pouch. 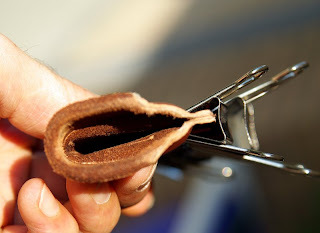 By wetforming it with the back on a flat surface, the welt of the liner gets covered completely, so there's only a small welt in the pouch. 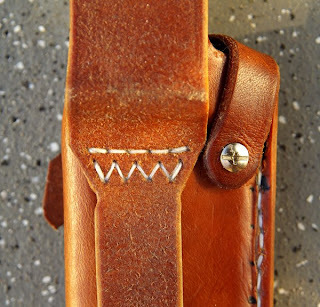 The Pouch and beltloops are glued and doublestitched with waxed tigerthread, using the saddlestitch method. 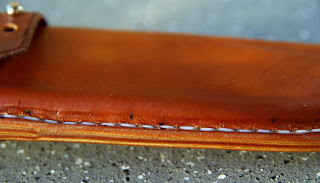 All the stitching is sunken into the leather, so it won’t stick out, protecting it from abrasion.All the edges are polished, protecting it from dirt and moisture, and all sides of the leather, except the inside, are treated with Sno Seal, which is mainly beeswax. 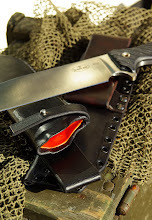 There is no stitching making contact with the blade once it’s sheated, so abrasion from the inside is impossible. 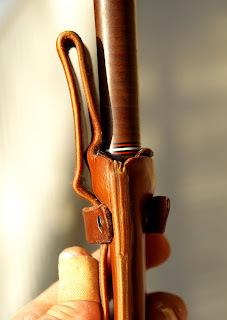 Here you clearly see the rawhide core of the leather. 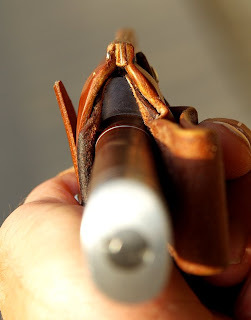 a detail worth mentioning is that the chicagoscrew holding the strap is secured with lok-tite, and that between the strap and the pouch sits a teflon washer, securing a smooth operation without working the screw loose.. 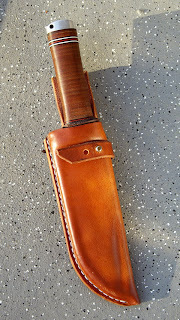 This is an amazing looking sheath! 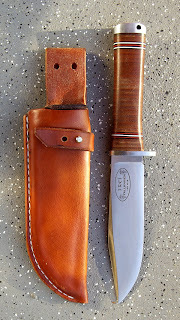 I really like that sheath Martin. 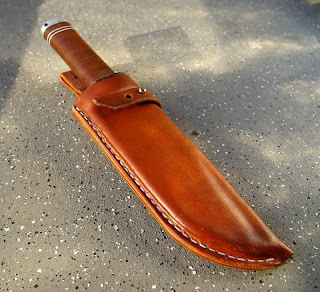 I am getting s Frej soon so I might need a sheath like that.